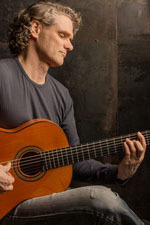 Cook studied classical guitar at the Royal Conservatory of Music, moving on to York University, and jazz at Berklee College in Boston. On his albums, and in concert, Cook explores the roots of flamenco, and it’s many offshoots, from India to Spain, and on to Cuba and Latin America. Along the way, he developed his signature synthesis of world music. He has released ten genre-defying albums, garnering eleven Juno (Canada’s Grammy) nominations – and one win, in 2001 for Free Fall – in the World Music and Instrumental categories.